So often we can get caught up in building out huge resources. Let’s stay in the discounts and warranties space. 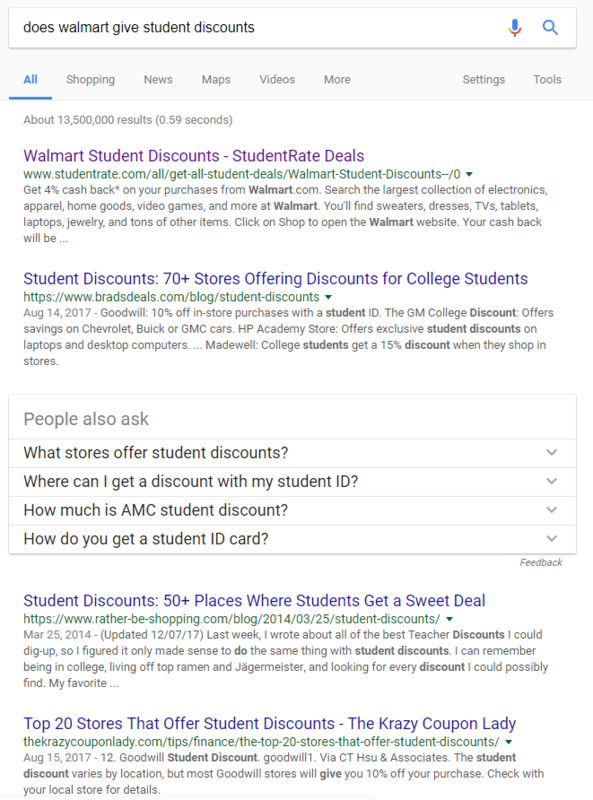 Does Walmart Give Student Discounts? Outside of the StudentRate result, does anyone want to click on these? You’d have to take a step back to first ask who is searching for this. It’s very likely a student or their parent, trying to find out if they can get a discount at Walmart. I don’t need to know the top 20, 50, or 70 stores that offer them, those are irrelevant if I know what I want is at Walmart. We saw some of these opportunities of stores that offered discounts, price matches, price adjustments, or other areas that people searched. They weren’t searching to peruse a list of stores to keep in the back of their head, they had a very specific intention; to see if a singular store provided what they were looking for. So we tested this on three pages. We also had an aggregate post with a few dozen of the stores. The aggregate post gained almost 2,400 sessions over the course of 9 months. The three store specific posts had over 30,000 sessions over 9 months. These three pages aren’t rocket science. They’re built for answer boxes and directly answer questions about discounts. They are under 250 words. There are two BIG items to note about why specific, audience-centric content is successful. When a store like Costco blocks their entire customerservice.costco.com subdomain using robots.txt, Costco suddenly becomes a much less relevant result for their own customer service branded searches. We drove 23 first page rankings (via SEMRush) to one of these three pages. Adding up all of that volume for those 23 keywords, it came to about 36,000 searches over 9 months. That individual page drove 20,000 sessions in 9 months. Those 23 keywords didn’t drive all of that traffic, longtail did. THE LONGTAIL IS KING and often underestimated. People search in all sorts of weird ways. They’ll type 3 word general phrases, 7 word questions, add a physical location to it, you name it, searchers do it. Testing small batches of content like this, 3 pages, can help trigger a larger strategy across hundreds of stores. If we were to predict the amount of traffic we’d get based on ranking somewhere on the first page for 23 keywords that have a total monthly search volume of 4,000, the best we could hope for is getting 20% of that every month. This is why I don’t like to try and predict the type of traffic we may get. “Let’s test it” is the drum to beat. Does it drive value or solve a problem for their customers/potential customers? If yes, great. Move on to finding out if the potential traffic/conversions from creating pages outweighs the actual cost. Does it drive revenue for the business? In the example I used, there’s an affiliate model and an advertising model at play. Sending just traffic generated revenue and some of that traffic went on to drive affiliate revenue. Our success was also largely measured on organic traffic increases, so this made sense for that client. Does it do anything to build the brand as an authority and support the rest of the site? If it can help from the pov of a branding play and drive tons of high funnel/above the funnel searches, great. 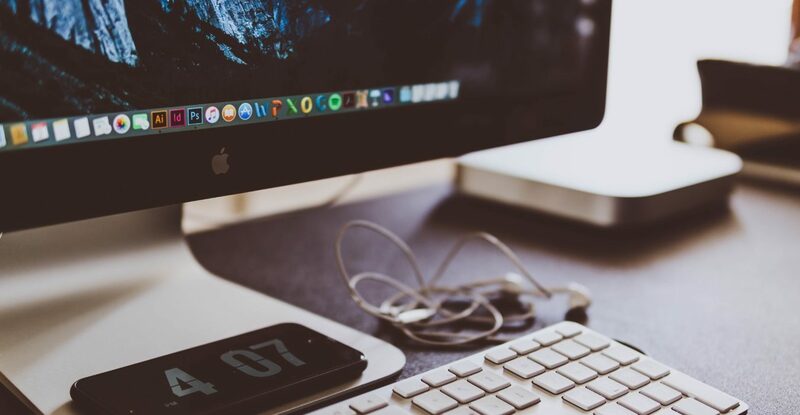 Confirm that’s considered a success with your client or site, determine how to retarget those people if it makes sense, and determine how you’ll measure other metrics, like increases in branded searches, if it’s possible. What Areas Do I See Opportunity for Organic Traffic? The Costco example above doesn’t have to be a unicorn. Many other sites will combine customer service questions into one long page. If you create an individual page with a direct answer that’s there to help users, you stand a good chance of bumping even the company if you’re a somewhat authoritative site. SlickDeals had a TON of old forum pages dated back to 2006 that still rank today. Find that low hanging fruit and take it over. If you see them showing up, it’s Google begging for you to rewrite that content and publish it to help users. If you see other areas of opportunity, I’d love to hear about them and will update the post if they’re commented and credit you. In the end, simply answering customer questions in an easy to digest format is one major way to get wins in 2018.